Aerial accomplishment awaits ZipGatlinburg, where more than 100 obstacles keep outdoor adventurists on their toes. The beauty of the Smoky Mountains is the backdrop for an assortment of suspended bridges, zip lines, ladders and nets that serve to challenge would-be Tarzans. 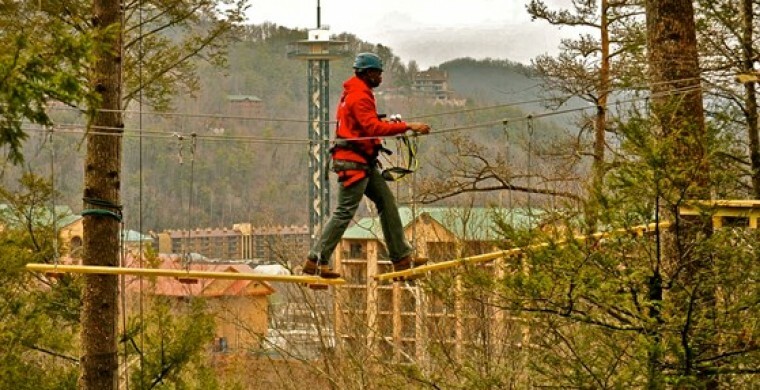 Just a short drive from our Gatlinburg hotel, this favorite Gatlinburg attraction features a 27-stop obstacle treetop adventure and a 1500-square-foot trapeze next that soars 30 feet off the ground. Afterwards, wind down back at Zoder's Inn & Suites, where you can take a dip in the pool or simply relax alongside our rippling stream.